This edition is being written as the revised website, with my Blog, finally launches. Let’s hope it finds its “sea legs”! Everything here is new. There’s some cool stuff about Harry Blackstone, a.k.a. “The Great Blackstone,” and his most famous trick. He’s the magician who Nick speaks of in Chapter One of the novel. The featured story is “Saving Chicago,” which describes an absolutely unique solution to what was a terrifying environmental problem. As usual, there’s “Wisdom with a Smile”: Thoughts to buoy your spirit while jabbing your funny bone. Then I talk about what’s history and what’s not history in a historical novel like Illusions of Magic. Then too, you’ll want to find out a little about Andria Williams’ just-published novel. Phil’s homes remind me of the spirit I sought to catch in my illustrations for Illusions of Magic. Phil’s comment about a return to the illustrated novel is worth noting: “Perhaps the best way to bring back appreciation for the illustrated book is to create great illustrated books!” Bravo, Phil! Since long before the Civil War, Chicago drew its drinking water from pipes extending offshore into Lake Michigan. The unprecedented growth of the city in those years caused the limited capacity of the underground piping and pumps to undergo several major revisions. However, it was soon apparent that its major problem was not capacity, but pollution. In the 1850s, cholera epidemics caused thousands of deaths. These were traced to contamination of the Chicago River, which flowed through the city gathering both residential and industrial waste before emptying into Lake Michigan near downtown. The water intakes were repeatedly moved farther and farther offshore, but sewage soon reached them, contaminating drinking water. The situation was dire—if a solution were not found, many more would die. The question was: What to do? Sanitary engineer Ellis S. Chesbrough advocated what at first seemed impossible—reverse the Chicago River. If the river’s flow were reversed, its waste would eventually join the Mississippi River, meanwhile becoming diluted to relatively harmless levels. And Chicago would be saved. But how could the river’s flow be reversed? Chesbrough’s ally was nature. The Upper Mississippi Drainage Basin, a land area of more than a million square miles draining to the Mississippi River, is just west of Chicago. The Des Plaines River, only twelve miles from the city, flows south, where it eventually joins the Mississippi River and subsequently empties into the Gulf of Mexico. Chesbrough saw that a canal connecting the Chicago River to the Des Plaines River would allow the flow of the Chicago River to reverse. Thus this geographical quirk (and a lot of digging) could save the city! Construction to accomplish this unprecedented feat began in1892. Dynamite and huge steam shovels dug a 24-foot deep channel, which upon completion stretched 28 miles, at first paralleling and then joining the Des Plaines River at Lockport. At its narrowest (160 feet) it allows barge traffic to traverse its length. It was named The Sanitary and Ship Canal to define its diversion and navigational functions. Completed in 1900, the Canal construction represented the largest earth-moving operation in North America at the time; the techniques developed were later used in digging the Panama Canal. The reversal of the Chicago River allowed the City of Chicago to survive and continue its growth into the megacity it eventually became. If you put things off like I do, you’ll want to join our Support Group for procrastinators. However, a date for our meeting hasn’t yet been set. Illusions of Magic is a historical novel, but it is not history. It faithfully describes many real-life events following the 1933 assassination attempt on President-elect Franklin D. Roosevelt. So where is the difference, and why is it not history? The novel places fictional characters and fictional events within an authentically-depicted background of true-life events and settings. Because readers like to know which is which, I wrote an “Author’s Note,” which appears in the Collectors Print Edition (CPE). It explains the difference in detail. If you’d like to enjoy this feature, be sure to sign up below for “Nick’s 99”—your opportunity to receive the Collectors Print Edition (signed by me) at no extra cost! Harry Blackstone, Sr. (1885-1965), appears early in Illusions of Magic, when Nick admires the famous magician performing at the Edgewater Beach Hotel. It’s unknown if the real-life Blackstone (born Harry Bouton) actually performed at that venue. However, Chicago was his hometown, so an appearance there seems likely. Like Nick, Blackstone was well-rounded, capable of close-up tricks with cards or coins as well as stage performances of larger-scale illusions. He’s most remembered for “Sawing a Woman in Half” in which a female assistant, lying down inside a showy horizontal display, is apparently cut in half by a saw, a sharp knife, or other large blade. The woman survives this apparent separation; she’s quickly revealed to be alive and healthy. Because of my background in nuclear reactor technology, I recently talked with Andria Williams, author of The Longest Night (Random House). This historical novel is a finely-detailed examination of a military family’s dynamic as they interact with a small military group in Idaho in 1959-61. The men are there to operate a low-power nuclear reactor used for training and demonstration. Faulty design and malfeasance, portrayed fairly in the book, contribute to a fatal nuclear accident like the real-life SL-1 event of Jan. 3, 1961 at NRTS near Arco, Idaho. Learn more at http://www.andriawilliams.com. Thanks for taking time out of your day to check out my blog. I try to write stuff you might not come across elsewhere. Please let me know what you think. 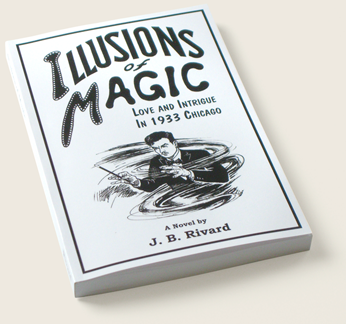 And… if you think one of your friends might enjoy the site, tell them to Google “illusions of magic illustrated novel”— it will take them right to it.